This isn’t where we intended to be….. It is hard to find anything positive to write about the appointment of Donald Trump to the most powerful political position in the world. Even without considering his far right views, his links with white supremacists, his obsession with Putin and his sexist behaviour, the man lacks the experience and knowledge to play a key role in world diplomacy. I will leave it to the politicians to determine if there are any silver linings to come from the Trump cloud. The lack of Sarah Palin and Rudy Giuliani in his cabinet might be a cautious note of optimism as might his backtracking on Obamacare. His wall that turned into a fence and which I now suspect is heading toward an ornamental privet hedge may also be an indication that he will step away from some of his more controversial campaign promises. I hope so. 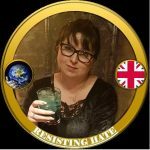 But as an anti hate group Resisting Hate are more concerned with people than policies and though undoubtedly we will all be keeping a very close eye on the news in the weeks and months ahead it is the impact on hate crime and how this affects societies and individuals that is uppermost in our minds. These crimes are being depicted as reactionary and some of them undoubtedly are. But it is also human nature to see patterns where there are none. It is inconceivable that every piece of Anti Semitic or Islamophobic graffiti is a direct result of the impending presidency of Donald Trump. We cannot attribute that level of influence to the man. Nor can we credit the kind of people who do write their hate slogans on bus shelter walls as necessarily being politically aware enough to have followed the election campaign. Hate has been with humanity since the dawn of time. 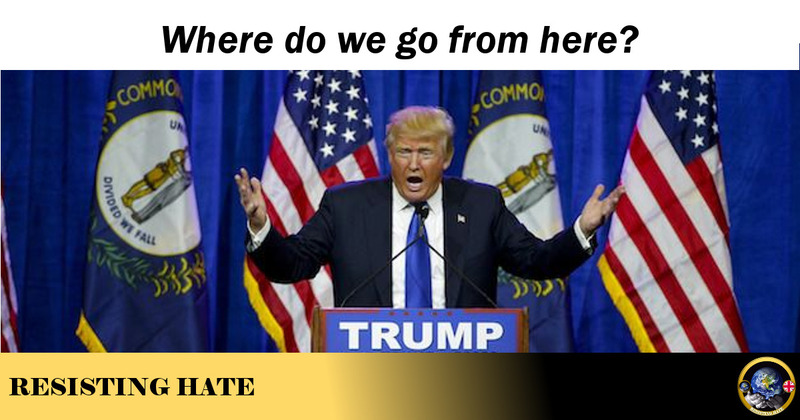 Hate was around before Trump and it will be around after Trump. What I am saying is try not to feel despair if you are seeing it for the first time. Trump may have brought this hate out into the open but he has not created it. Bringing the hate into the open is obviously not a good thing for the people being subjected to hate and prejudice but it is also not a good thing for those who perpetuate the hate. People like Stephen Bannon for example were not, relatively speaking, well known public figures prior to the election. (Many in the UK had never even heard of Breitbart let alone knew who runs it). Now he and his ilk are making headlines and being openly recognised for who and what they are. The consequence being they will be unable to promote their insidious agendas behind closed doors. We may not like the Republican party but even they would balk at the more extremist hate views promoted by Neo Nazi white supremacists. It is perhaps better we can see and publicly shame these people for what they are. Ironically we are best placed to do so when they hold public office. Seeing the hate crimes publicly reported so widely also exposes the underbelly of hate that has been festering both sides of the Atlantic for a long time now. I want this stuff highlighted in the press. I want people to be aware that there are sick people in our societies who talk with glee about “ovening Jews” and blowing up mosques. This hated has been smugly written off for too long as “just words” or “just social media”. It is imperative we understand the repercussions this hate has in our communities. It is only through direct exposure that people will understand why it has become such a problem and will finally come to the conclusion that something must be done about it. If you were too apathetic to vote in the last election then read the papers, you sure as hell won’t be in the next one. Trump ran his campaign capitalising on the fact that he was the candidate of change, the candidate against the establishment. If he sticks to many of his campaign promises and legislates on hate principles then hate will become entrenched in his politics. Hate will effectively have become the establishment. And just as the people voted for change in 2016 a sadder and wiser electorate will vote for change again in 2020. They will vote to kick the hate right back out of politics. It took 71 years for the world to forget Nazi Germany to the extent where they would welcome fascism back into mainstream political systems. After Trump I believe it will be at least another 71 years before it is welcomed in again. 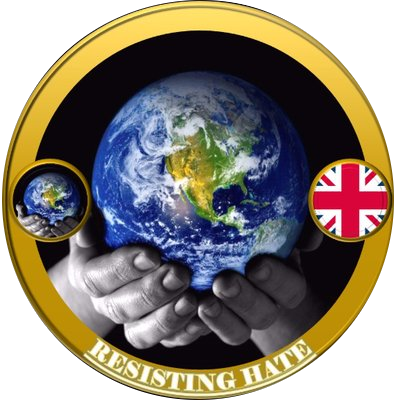 Much as I do believe exposing the hate is important and confident as I am that Trump’s political future will be a short one the actual positives that come out of this farce of a week are positives that lie in our own hands. Minority groups may be being targeted but these groups are only a minority if they stand alone. Now is the time for unity. If a world that has suddenly become very aware of an undercurrent of hate is willing to unite and stand together as a force for human decency then possibly Donald Trump could end up being the catalyst for something very good. Our future lies in all of our hands. If we are able and willing to overcome our differences, find common ground, build bridges between communities and stand united against hate then we will get the world we want. If we are unwilling to put the effort in then, sadly, we will get the world such apathy deserves.